Currently seeking ‘Expressions of Interest’ for keynote speakers – for the NPA 2019 Series. NPA is developed exclusively for senior executives in the social purpose sector, providing the only collaborative Peer2Peer support platform of its kind. We believe that social purpose organisations need to invest in the capabilities of their leaders and those who will be leading their organisations into the future. NPA is a program for leaders who want to challenge traditional approaches to business and challenge themselves; for people who want to grow their leadership capabilities. The NonProfit Alliance (NPA) Leadership programs bring together leaders who are united in their belief in creating a better world; who choose to work in unique but complex organisations which deliver social outcomes; and who ultimately believe in their ability to affect meaningful change. The leading Peer2Peer NFP Community in Australia. 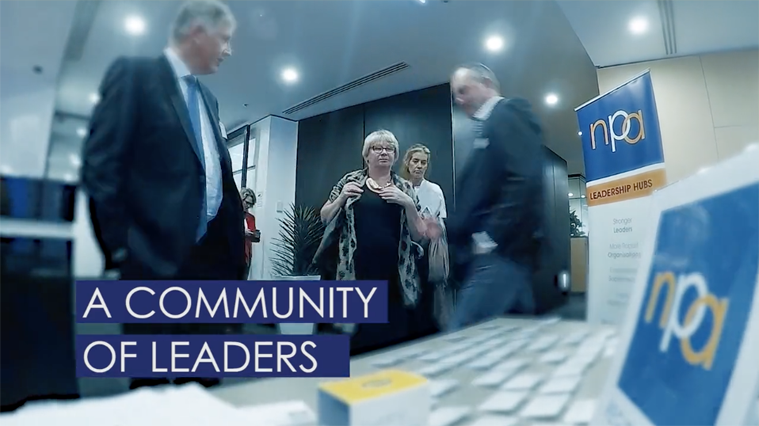 Exclusively for CEOs and Leadership Team members, the NPA Leadership Hub is a vibrant, supportive, learning and mentoring network focused on developing the skills and expertise of senior executives within Australia’s non-profit sector. Tailored programs that address NFP’s unique challenges and opportunities. Exclusively for senior managers and aspiring leaders, the NPA Coaching Program is a personalised learning and mentoring journey focused on developing the individual leadership skills and expertise of managers who are wanting to move up in the sector. A positive platform for professional development. Your individual Strengths Profile will help you to develop strategies that maximise personal growth, performance and wellbeing. Designed by Alex Linley from a decade of theoretical and empirical research in positive psychology, this program aims to unlock your performance potential and help you to realise your leadership strengths. Our members come from a variety of different areas of the non-profit sector and all believe in collaboration, peer-to-peer support and the power of being part of a NPA Leadership Hub. Watch this short video to hear more about our program. To see more about our members click here. Want to keep up to date with what is happening in the NPA community? Leave us your details below and we will make sure we send you all the latest news, leadership insights and opportunities to meet like-minded sector professionals.